The spring thaw has started at Loch Vale and the ice is starting to receed from The Loch. 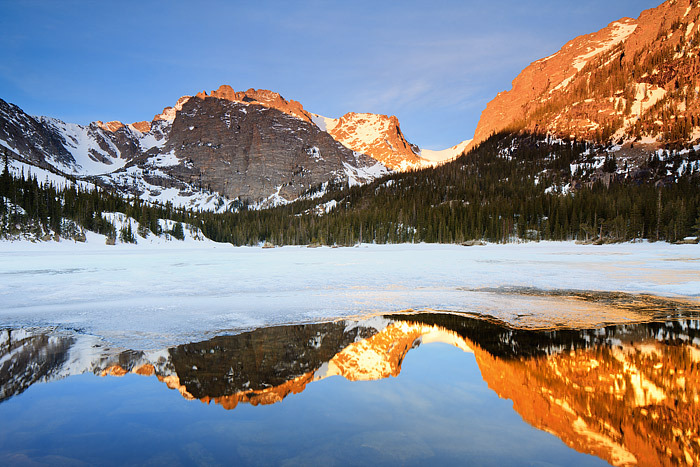 The Cathederal Wall reflects over the open water as cirrus clouds float over this iconic Rocky Mountain National Park locale. The area around Loch Vale is accessed from the Glacier Gorge trailhead and it's one of the more popular hiking destinations in Rocky Mountain National Park. Photo © copyright by Thomas Mangan.